Tencent’s earning’s call on Wednesday has understandably caused a lot of debate. The first drop in profits in 10 years is certainly something worthy of discussion. Tencent’s share price has clearly had a horrid time of things this year. Yet I’ve somehow found myself somewhat confused at the narratives being spun around this situation. Below I took a bash at breaking down 2 of the reasons for being less optimistic about Tencent and offering perhaps a different yet hopefully informed take on things. Rating each issue on the criteria of its impact to the long-term health of the company. I’m going to cover this one first simply because it’s the one that’s garnered the most attention recently and perhaps rightly so given that its new information for most of us and a pretty unique situation. It’s not every earnings call where we are treated to the spectacle of Tencent’s higher management having to explain the gory details of how government approval processes work. Yet they find themselves in the rather awkward situation of having to explain to investors exactly why they essentially have their hands tied behind their backs in terms of monetizing their top blockbuster titles in China currently. I’m a not surprised about the negativity surrounding the discovery that China’s government gaming regulations are even more byzantine, opaque and quite frankly impossible sometimes for even the biggest and most connected local companies to navigate through. In the short-term, this situation is undoubtedly terrible news. From a long-term perspective viewpoint, however, I think we can be more positive. It essentially amounts to extra regulatory lock-in for Tencent. If the rules and regulations are becoming more difficult that will cause pain for everyone in the industry, not just Tencent. Yet the biggest companies are the ones best placed to be able to deal with it. Mid-sized gaming companies might not have the cash reserves to wait on the sideline while their top titles wait for government approval. Undoubtedly the requests for changes to content from the government agencies (e.g. removing blood from shooter games) will harm the playability of the games for some users but they will harm all titles equally not just Tencent’s. As Tencent’s higher management pointed out on the earnings call, their mobile game user numbers are continuing to grow quite healthily. Chinese gamers aren’t going to stop demanding new games to play and it’s not realistic to think that Beijing is going to ban monetization of mobile games. Despite how it seems sometimes, they are simply not going to cripple one of their national internet champions. The reality is that Beijing needs both Alibaba and Tencent to be strong, they are the only companies that have the size and scale to take on America’s own internet giants. For a gaming industry leader like Tencent, one of the worst things about the industry is its inherent volatility. New titles can suddenly come out of left field and take the industry by storm in ways that are difficult or perhaps impossible to predict. This is exactly what happened with PUBG, the blockbuster title that Tencent cannot currently monetize in China. Tencent’s management really needs to be given more credit for the turnaround that they achieved in the multiplayer battle royal genre. There was a certain point last year where I was really concerned for the company’s position in this new hot gaming category, quite simply they looked like they were going to miss the boat. Yet they achieved a complete turnaround through the aggressive acquisition of the PUBG rights for China and then through the rise of Fornite developed by Epic Games a developer they previously took a major stake in. Now they look like the company likely to benefit most of anyone from the popularity of this genre. An amazing turnaround. Seems Tencent dodged the bullet and did fairly well this time. To their credit, they’ve made enough savvy investments and acquisitions of top quality global game studios that when a hot new genre comes to rock the gaming industry’s boat at least one of their portfolio companies will likely end up being the one that comes up with the killer title (which is exactly what happened with Fornite in this case). The more difficult it gets to meet regulations in China the further this plays into Tencent’s strategy and cements their leadership in the gaming space. The regulatory uncertainty is bad for Tencent but it could be a death sentence for many small and mid-sized gaming companies within China, many of who may choose to leave the market. From Tencent’s viewpoint, that means less competition and less chance of being disrupted locally by the next PUBG. For any non-Chinese company with a hot title that wants to license it into the mega-lucrative mainland Chinese market, ironically Tencent is now an even more attractive partner. As the biggest player, they are still the ones with the strongest resources to be able to try (even if they can’t succeed every time) and mitigate these daunting regulatory risks. All of this has echoes of the call to regulate Facebook earlier this year. As several concluded, regulation of social media in America would most likely end up having the perverse effect of cementing Facebook’s leadership in the space. The rivalry between Tencent and Bytedance has been dissected endlessly by Chinese media, surprisingly (to me at least) much less has made it over to English. The rise of Bytedance’s micro-video application Douyin, known internationally as Tik Tok, is surely one of, if not THE major success story of China’s internet industry in the first half of 2018. Bytedance has proved themselves to be very capable. They are far from a one trick pony and now have a family of apps (a-la Facebook) with two major knock-the-ball-out-of-the-park successes, the original newsfeed aggregation app “Daily Headline” known as Jinritoutiao in China and now the even bigger success of Douyin. 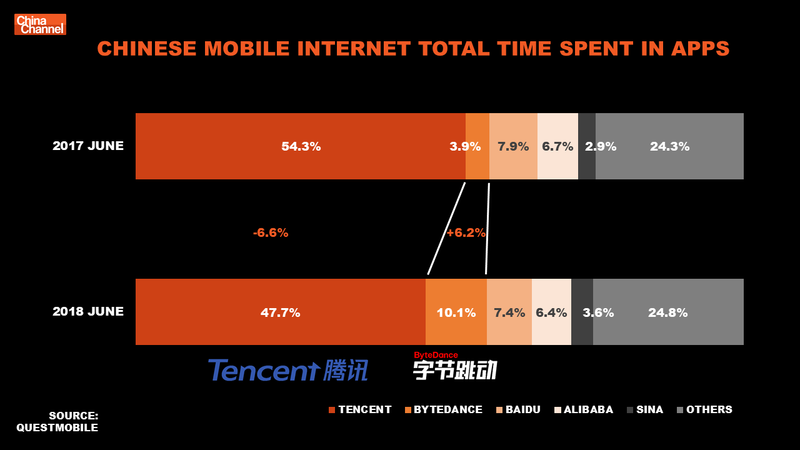 Why is this both an important long-term problem for Tencent? Tencent’s losing it’s grip on attention a little. Entertainment is a zero-sum battle. A user can’t spend time on Tencent’s properties if they are busy scrolling through micro-videos on Bytedance’s platforms. The situation is by no means critical but it’s concerning. It certainly should be concerning to investors and much more so I believe than a temporary blip in gaming revenue. This shift in attention is not showing up that strongly in Tencent’s financials currently; the online advertisement segment did okay this quarter. Tencent is still a very conservative organization (famously so in fact) when it comes to ads monetization and there’s plenty of runway still. Yet even if Tencent did lose many eyeballs which they weren’t really doing a great job of monetizing anyway, why as an investor should I care? Because Bytedance has built an alternative Chinese ecosystem of news and entertainment apps which, while smaller, now rivals Tencent’s ecosystem for where Chinese users will go to kill time on their phones, where advertisers look to spend ad yuan online and where media or influencers look to distribute content. They’ve done the hard work and built up a lot more than just a foothold (see chart above). Whatever direction they choose to take things from here the next steps will be easier than the previous ones, they have momentum. Tencent has a nimble and dangerous independent competitor of scale in the local market eating up time from their pan-entertainment empire. That’s what investors should be concerned about. The $75 billion* USD problem.